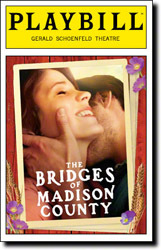 Composer Jason Robert Brown was the first thing that attracted me to the stage musical of The Bridges of Madison County. Brown’s responsible for The Last Five Years, one of my favorite scores ever; Parade, which has some incredible music; and “Stars and Moon,” a favorite song from his Songs for a New World. His music is so good, I’m game to see almost anything he does. I’ve never seen the Bridges movie. I have, however, read the book, though it was a long time ago, around the time the film came out and I don’t remember much. I know from the notes in the Playbill that Francesca and Robert were made younger for this version, and that change works here, seeming to put more at stake because of Francesca’s age along with the age of her kids, 16 and 14. There are advantages to starting over, but also the risk of hurting her family. Beyond the gorgeous music and the performances of O’Hara and Pasquale, the lighting design of the show is beautiful. As you can imagine, in a story that starts with photography and some discussion of lighting, you would want the lighting to capture that. The photo below gives just a hint at the atmosphere Donald Holder achieved with his lighting design (he’s won Tonys already for The Lion King and the recent South Pacific revival and been nominated several more times). There were a couple of distractions in the show. First, the scenery seemed always on the move. Sometimes it’d be in place for only a minute or two before it was time to change it up again. Having the supporting actors move it, made sense because it conveys the sense of being in a small town and always being watched. However, it made the stage very busy at times. Also, there were several flashbacks in Act I and that pulled away from the budding romance between Robert and Francesca. Those issues though, don’t diminish how beautiful this show is overall. O’Hara and Pasquale signing Brown’s score is more than worth the price of admission. Next week we’re off to the theatre again, this time for Terrence McNally’s new play, Mothers and Sons, starring Tyne Daly.